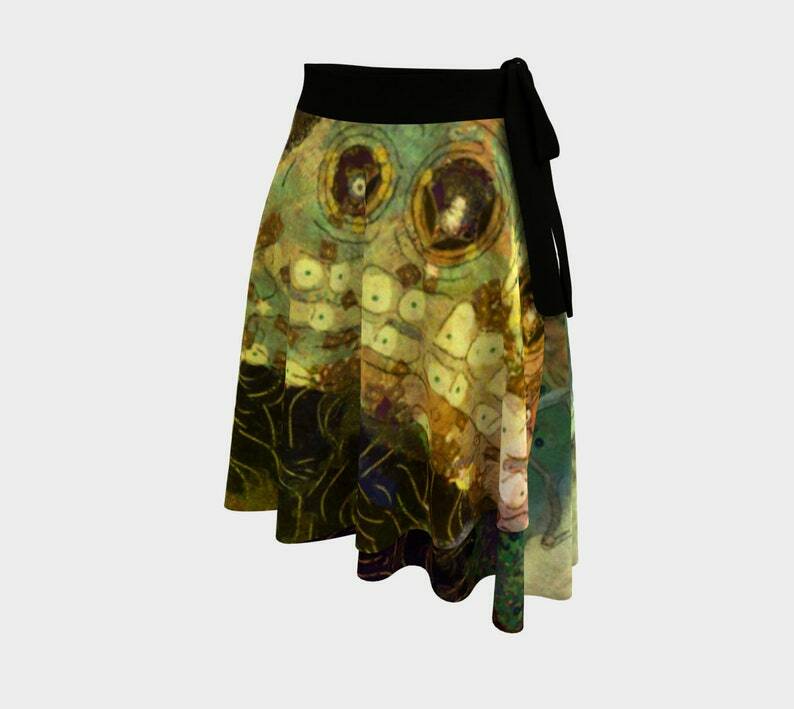 One Size Wrap Skirt with my printed artwork with soft fabric. It drapes nicely with a full circle design. This is called "Golden Butterfly" with rich purple and gold colors in Klimt style and deep brown background. Fun as a summer beach skirt cover up, or for lounge wear, ballet dance skirt or for ice skating and great over leggings, or wear it as a shoulder wrap. Very delicate and fun for women or ladies of all ages and sizes. 100% lightweight polyester Matte Crepe which is silky soft. • Waist tie is made from bamboo jersey fabric for a perfectly comfy finish. Choose Black, Gray or Cream waist tie. • The simple full circle design means people of all shapes and sizes can wear these wrap skirts. • Never-fade vibrant full color sublimation print lasts even with repeated wear and washing. Peachskin Jersey - Machine or Hand wash in Cold water. Tumble dry on Low or Regular. Or Hang to Dry. Do not Bleach. Soft Crepe Fabric - Hand wash in Cold or Warm water. Hang to dry. Fits Waist 22" to 42", the actual skirt fabric is 52 inches across and 23" in longest part with 17" asymmetrical circle wrap around. The fabric will wrap around your waist more for small waist so it will be longer in length, less wraps around for greater size which makes it shorter. One size for all. This is a custom made item with my artwork, created when you order it. Once the order is placed, manufacturing begins and no cancellations or returns are accepted as each item is made to order. Monitors vary and each item is handmade so variations can occur. The items are Canadian made with attention to detail and environmentally friendly products. Art meets Fashion through creativity and passion.